For the last three years, on a Saturday morning around this time in November, I have woken to a dull thud behind the eyes, a thirst, that if quenched, would bring about a hosepipe ban, and the woeful admission that have no idea where I am. As I was not attending the 2013 Swartland Revolution, I had expected this last Saturday morning to be somewhat more convivial. Perhaps it was out of a misplaced sense of camaraderie towards those in Riebeek Kasteel, or perhaps it was just the vast amounts of brilliant wine open at this years Platter Guide launch, or maybe, just maybe, it was that last glass of brandy at 3am that did it, but as the first pounding thwack of consciousness arrived on Saturday morning, I thought for just a second I was back at the Revolution. But you cannot blame me. 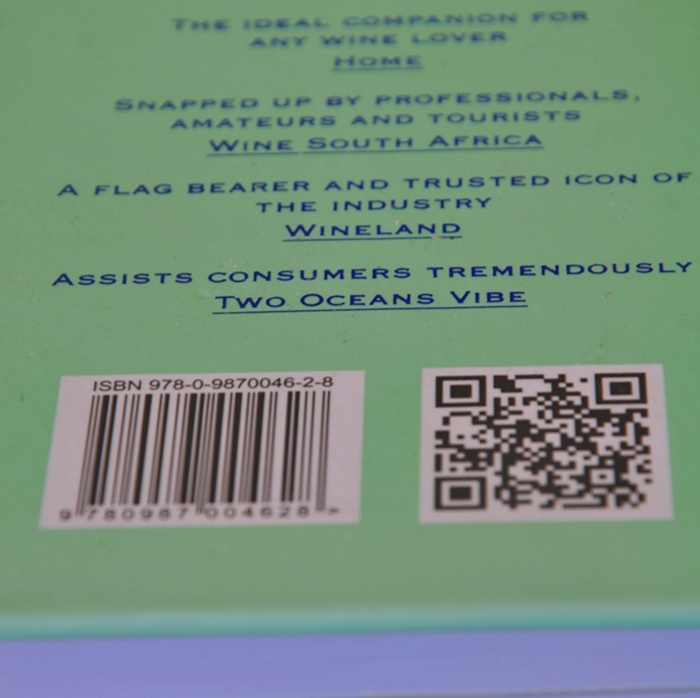 The 2014 Platter guide 5 star wines are delightful. I worry about your sense of South African pride if you left the Vineyard Hotel on Friday evening sober. Even if you could resist the sheer amount of vinous pleasurables on offer, the bon homie of toasting to so many people’s successes, and the ravenous desire to escape the boredom that handing out awards creates, inebriation was a foregone conclusion. I, my friends, was helpless. I am not sure what happened this year, but it seemed as if the Platter team had invited double the amount of guests. Perhaps they thought everyone would be stroking Adi’s side burns in the Swartland, or praying at Eben’s feet, and felt the need to fatten up the guest list. Last year was positively civil compared to this year’s crush. The Platter launch is the single best walk around tasting of the year. One, because the wines are of course excellent, and two because it’s a relatively calm affair. The who’s who of the South African wine landscape are in attendance; and while making idle chit chat praising the selection, or making snide remarks about some wine they like not making the cut, the attendees sip quietly on the contents of the year’s top scoring bottles. This year, however, it felt like I was at the De Toren table at WineX. Even a sardine would have felt claustrophobic. Wafts of perfume, sharp elbows, glasses swishing perilously close to one’s ear, hands grabbing for the Radio Lazerus, The Jackal Bird, the Raats Cabernet Franc, a Newton Johnson Pinot; pushing and squirming for a taste any of the Mulleniux’s wines. The room seemed tiny, the guests innumerable, the snacks hoovered up in an instant. I was hoping to quietly make my through most of the wines, sipping, swirling and spitting though a galaxy of red stars. But the scrum was too much. I poured a big glass of the Radio Lazarus, and retreated to the saftey of the room’s centre. Rosa Kruger was on hand to collect awards for those revolting in Riebeek. 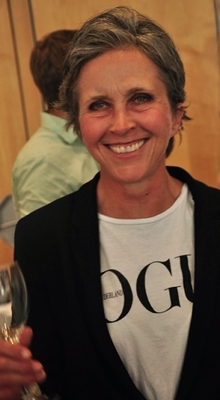 She took home the winery of the year award for the Mullineux’s. All three deserve it. My plans of a thoughtful tasting dashed, I sipped on my Radio Lazarus – such a pure Chenin, with quite shocking depth and finesse. 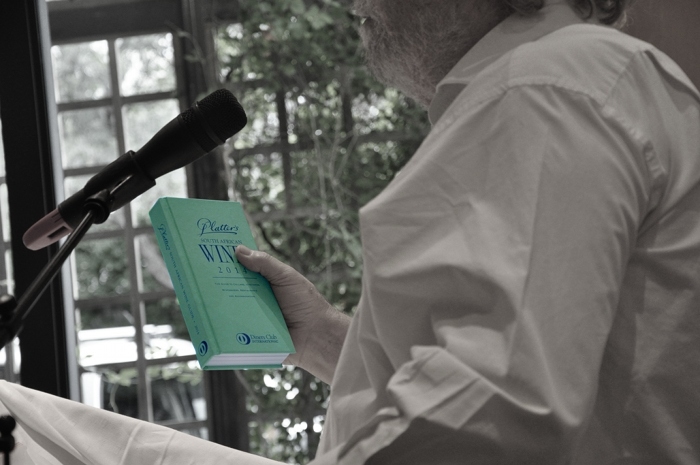 I had hoped to have given you some sort of an account of the winning wines, perhaps even a few notes. But all those elbows, all those desperately searching glasses were too much. And anyway, Angela Lloyd had already written a pre-prepared summary , which you can find here, or, if you like, scroll down for a list of the winners. I retrieved a glass of the Newton Johnson Family Vineyards 2012 – charmingly succulent, clean, bright, satisfying – and went outside for a smoke as the awards had started to be handed out. This may sound rather rude. But I had slapped a number of backs already, completed more than my quota of high-fives, and faced with the choice of clapping, or the ingestion of some much needed nicotine, it was hardly a fair fight. And then a serious bout of drinking commenced. I went back inside to take up the clapping, photograph some winners, and to see what happens if you consume 100 stars worth of wine. 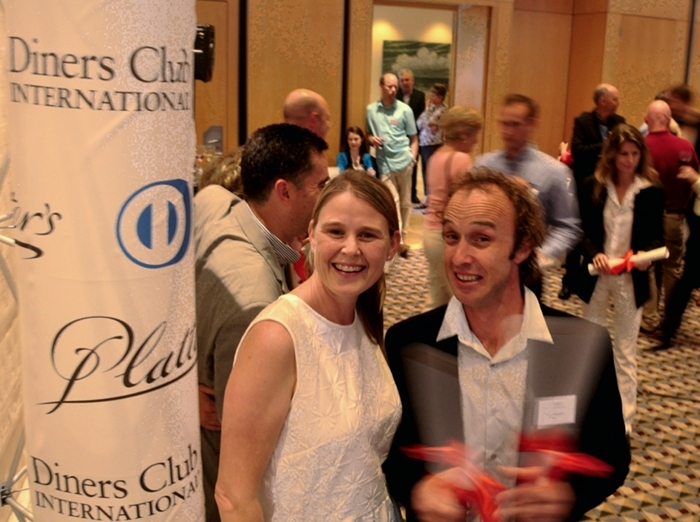 The Fables team, Rebecca and Paul, celebrate their winning Two five stars for the 2011 Syrah and 2012 Jackal Bird. The wines truly are fantastic. Awards based on something as subjective as wine will always create some form of controversy. But tasting the wines I could reach on Friday night, I was honestly taken aback at how many I really, truly, thought were excellent. Wines that that make your toes curl, wines that excite, invigorate, and never, ever, expectorate. It’s a good time to be drinking South African wine. Especially at the prices these sell for. Buy them while you can afford them folks. The party petered out, and I was collected, and taken to another party in town, where I switched to Beer, then Chinese food, then Brandy (the Alambic from Laborie – all green apple, honey, and spice, and four stars in Platter.) By all accounts a poor choice of things to ingest at that late hour. As I lay in bed, whimpering quietly on Saturday morning, trying to remember if I needed to send out any apologies for offenses I may have committed, I paged through the new edition of the guide. I suddenly saw that I too had been recognized by Platter this year. In fact, I had made the cover. Albeit the back one. Thanks platter. Although, just between you and me, it’s 2oceansvibe.com. Next time, why don’t we try something with a little more fizz. How about for 2015: “The only guide to your happiest hangover”. at least 80 reps from producers alone, given trajectory likely to be more next year so maybe a bigger venue or 2 separate events, one for media…. Totally. Also, if your 5 star winners increase, and you expect everyone to come and collect their piece of paper and pose for photos, you would assume a bigger venue is needed.